In 2015, GCLC’s Board established a category of Honorary Membership to recognize individuals who have made significant contributions to the worldwide collaborative law movement, and have consistently supported the mission of GCLC. We are delighted to recognize David A. Hoffman of Boston, Massachusetts and Jerry N. Jordan of Dallas,Texas as GCLC's first Honorary Members. 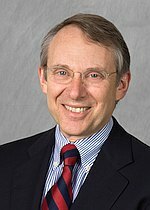 David A. Hoffman is the founding member of Boston Law Collaborative, LLC, and a founding member of the Massachusetts Collaborative Law Council. He teaches courses on Collaborative Law and Mediation at Harvard Law School, where he is the John H. Watson, Jr. Lecturer on Law. David has published several books and authored numerous articles and book chapters on peacemaking and alternative dispute resolution. He is a past chair of the American Bar Association Section of Dispute Resolution and founded the Section's Collaborative Law Committee. In 2015, the ABA Section of Dispute Resolution gave David its highest honor, the D'Alemberte-Raven award. In 2016, David gave a memorable TEDxTalk on Lawyers as Peacemakers. Jerry N. Jordan, a distinguished and highly respected attorney, engaged in a civil law practice in Dallas for over fifty years. In 2013, he received the prestigious Justinian Award from the Dallas Bar Association in recognition of his community and philanthropic service. For many years, Jerry has been actively involved in hosting and organizing programs for visitors from around the world visiting North Texas under the auspices of the U.S. State Department's International Visitors Leadership Program. Ever since collaborative law arrived in Texas in the early 2000's, Jerry has arranged presentations on the collaborative dispute resolution process for international visitors to North Texas.